Once Horus was born, Thoth appeared to his mother and urged her to flee with the child to protect him from his evil, red-haired uncle. 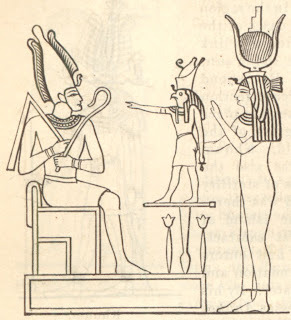 The great god of wisdom advised her to hide the little boy until he was old enough to “assume the office of Ruler of the Two Lands.” His mother then took Horus deep into the swamps of Lower Egypt where she placed her baby under the care of the goddess Wadjet (variant spelling, Uazet) who resided at Pe, a city on a floating island. Isis Goddess loosened the ropes that held the island fast and allowed it to drift further into the swamp where no man or god would know where to locate it or its divine resident. During the time of her flight with Horus, much adversity befell the goddess who felt utterly alone against the world while she walked far with her baby and her seven scorpion companions. Once, looking for refuge, they wearily approached the house of a wealthy woman who lived in a small settlement. When the woman saw the outlandish party, she hurriedly shut her door against them, not knowing whom she was turning away. Chagrined and hurt, Isis Goddess continued her wandering. After a time she found rest in the home of another woman, but her anger with the first continued unabated. Six of her scorpions transferred all their poison into the sting of one, Tefen, who slipped through a crack under the woman’s door and stung her son with the power of seven scorpions. Despite his mother’s piteous lamentations, the child soon died. The woman rushed about the town trying to find help, but this time it was she who was denied admission to other houses. In the midst of her grief she remembered her treatment of the strange woman who so much needed a friend, and she repented of her behavior now that she understood what it meant to be alone and rejected. Isis Goddess then showed mercy, calling upon her scorpions to withdraw their poison: “The child shall live, the poison shall die! As Horus is strong and well for me, his mother, so shall this child be strong and well for his mother!” From that day on, when a mortal suffered the sting of the scorpion, these words of Isis Goddess were used as a charm to relieve the effects of the poison. Later, Isis Goddess left her home in the swamp disguised as a beggar woman, for the great goddess had been reduced to begging for food to keep her son alive. When she returned home, she discovered the boy lying on the ground with tears in his eyes and saliva flowing from his mouth. Not even milk from a divine breast could ease his pain, and never had Isis Goddess felt more desperate. Finally, there appeared a woman bearing an ankh, who diagnosed the source of the problem: a scorpion bite. Isis Goddess repeated a series of charms, but nothing relieved the child’s pain. Then Thoth appeared again to the mother. He had just come, he said, from the solar boat where the gods were worried. The sun was standing still and the world would remain in darkness until the sun god of the future was cured. The anguished mother chided her old friend for moving so slowly. Didn’t he understand how much Horus suffered? Thoth in his own time assured her that he had come to help and finally began to recite a long charm designed to kill the poison; soon his ministrations had the desired effect. Once the child began to recover, Thoth ordered the women of the Delta to help protect Horus from his enemy and assured them that one day he would rule the Two Lands with the help of Ra, Osiris God , and Isis Goddess. The god of wisdom then returned to the solar boat to report to the boy’s father that all was well below. 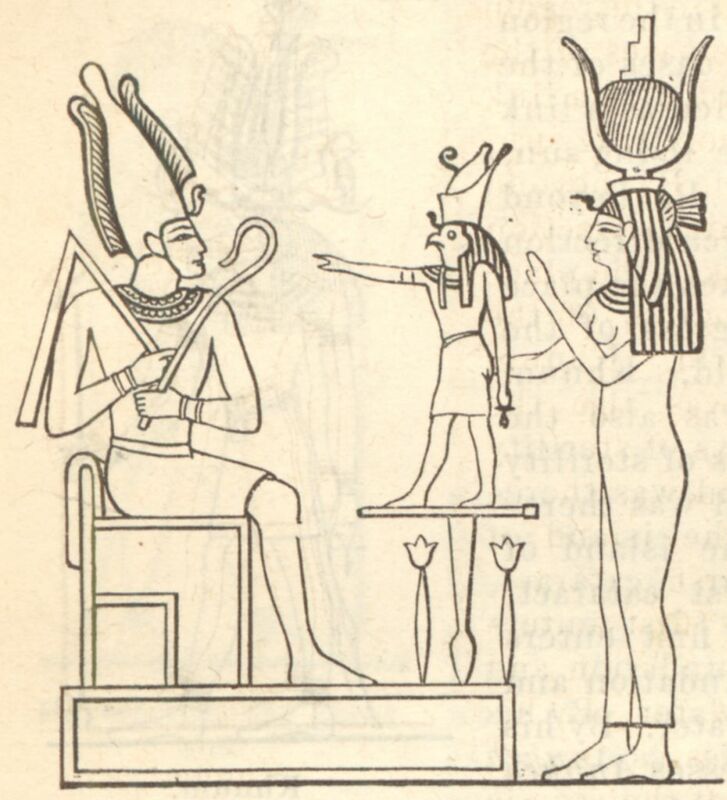 All was not well, however, for Osiris God and Isis Goddess. Seth was not satisfied that he was safe as long as Osiris God’ body existed. After Isis Goddess and Nephthys had embalmed the body with the assistance of Anubis and Thoth who had been sent for this task by Ra, Isis Goddess hid the body and set out to visit Horus at Pe. While she was gone, Seth went hunting wild boars by moonlight: he enjoyed the evil things that roamed at night. He was at full gallop after a boar when he saw the finely wrought chest he had used to trick Osiris God, and reined in his horse. Gleefully he jerked the body from the chest and tore it into fourteen pieces. Some said that he then scattered the pieces across Egypt, but the more widely accepted myth is that he threw the pieces into the Nile and let the waters carry them the length of the river. Then he laughed aloud and boasted across the world: “It is not possible to destroy the body of a god, but I have done what is impossible, I have destroyed Osiris God.” But Seth was mistaken.